Healthy heart – long life - ООО "Актив Лайф Технолоджи"
The promo-event Healthy heart – long life took place on December 20th. 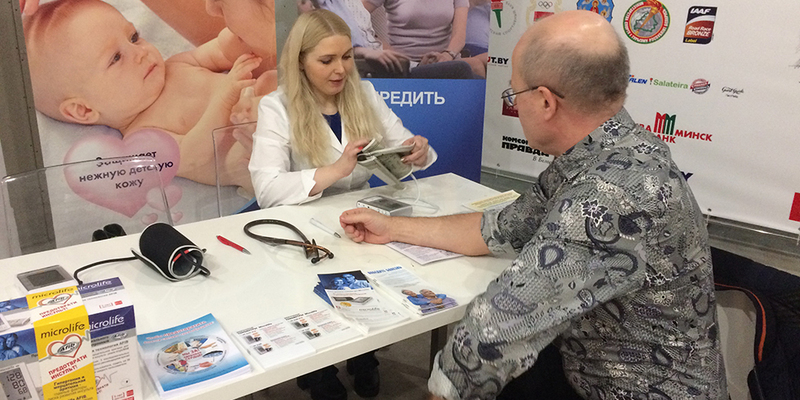 It had resulted from the successful collaboration of the City center for health and Minsk city cardiology hospital. Our brand Microlife actively participated in the promo-event. Applying the state-of-the-art and accurate Microlife blood pressure monitors the doctors measured the arterial pressure of everyone who wanted to learn it. The guests of the shopping malls Galerea and Korona, where the event took place, could get recommendations of cardiologists, as well as do a electrocardiogram. Such events have become a good tradition resulting from the fruitful cooperation of our Company and leading health institutions. The event was highlited by many Belarusian mass media representatives such as Belarus-1 TV channel, Vecherniy Minsk and Meditsinkiy Vestnik newspapers, Minsk News Portal. Plenty of participants engaged in the event were surprised by the fact that the up-to-date blood pressure monitors have the unique technology AFIB which provides 98 per cent precision in atrial fibrillation detection by a routine blood pressure measuring. 1 in 3 cases of atrial fibrillation leads to blood-stroke, thus, its early detection is vitally needed. Caring about own health is an important part of everyone’s life. Choose healthy food, proper rest, healthy lifestyle as well as give up the addictions and our Company on behalf of Microlife will help you care about your health.